"Elegant" is a word often used to describe Parioli, (prime) an affluent neighbourhood lined with cultured villas, charming old palazzi, gracious apartment buildings, consulates and embassies, luxury hotels, first-class restaurants, and popular nightclubs. Parioli's original residences were small, wealthy villas with gardens that arose in the area between Piazzale delle Muse and the San Roberto Bellarmino church. Early on, Parioli was an address conferring high status, and it became the neighbourhood of choice for diplomats, industrialists, and entertainment celebrities. During the high-flying years of Via Veneto in the '60s, Parioli rivaled it with its own chic cocktail lounges. The neighbourhood is surrounded by carefully tended green areas; these include the extensive parks of Villa Glori, Villa Ada, Villa Borghese, and the small but stately Villa Balestra park. Parioli has excellent cultural facilities, too; the most notable is the Auditorium Parco della Musica just west of Villa Glori. Constructed on the grounds that played host to the 1960 Summer Olympics, the massive Parco della Musica complex regularly holds classical music concerts, operatic performances, and theatrical shows. Another cultural highlight is the Villa Borghese, which marks the southern border of Parioli. The villa grounds house the Borghese Museum and Gallery, the Villa Giulia National Gallery, and the National Gallery of Modern Art. On the northern end of Parioli beside Villa Ada stands the Grande Moschea di Roma, largest mosque in all Europe. A contemporary building a monumental, timeless aura, the Grand Mosque is not just a place of worship, but also the seat of the Islamic Cultural Centre and an Arabic language school. 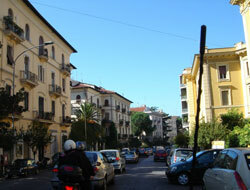 Several bastions of education, such as the Rome International School, the British School at Rome, and Marymount International School are in Parioli. Rome's largest university, La Sapienza, is to the southeast of the district. Elegant as it is, Parioli is not a very convenient base from which to explore Rome, as it is not that centrally located and there is little public transportation aside from a train from Piazza Euclide to Piazzale Flaminio. This is a very well-off district. It is quiet and elegant but not particularly interesting. Public transportation here is inefficient, so you will need a car if you are staying here. It has some food stores, but not much in the way of shopping or sightseeing. Vigna Clara is a safe area favored by the elderly and the middle-class. It only has a few small parks and it is lacking in character but it has plenty of different shops and supermarkets. Marymount International School is in this area. Vigna Clara has very little in the way of public transportation, only a private shuttle that goes to the Centro Storico.